Today you are 1 and we are celebrating. We are so blessed to have you in our family. Mommy and Daddy and your big brother Caleb love you as much as it is possible to love anyone or anything. We delight in your smile and your laugh. We are impressed by your sleeping abilities, your voracious appetite and your unfailingly good humor. It seems impossible that you have already been with us for a year, but equally impossible that you have not always been with us. We look forward to many more birthdays with you and all the days in between. Thank you for choosing us! Dear Isaac, Happy Brithday! We can't wait to mmet you. Gabe has been studying your Christmas card photos so he will already know you when we arrive and be ready to play! Awww! Happy Birthday to your sweet little boy!! Happy birthday, Isaac! What a sweet letter and cute baby. happy birthday isaac! he is adorable! i love the photo montage. 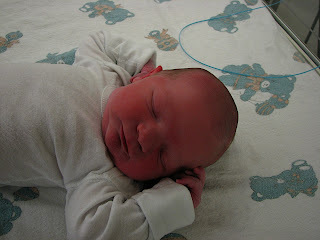 Happy Birthday Sweet Isaac, One year goes by so fast! I like what you said that it is hard to believe our babies are one year old, yet it seems like they've always been with us. I have to say that I'm insanely jealous that you are dressing your kids in shorts, t-shirts and no shoes these days. Our first mid-west winter has been nothing but brutal. We are rejoicing to be in positive temps today! Baby Isaac, baby Isaac - bpsbpsbpsbps. I love you so much! Love your - Auntie - Uncle Lane. I am impressed by his sleeping abilities, too. happy Birthday baby Isaac, we love you. Doesn't the first year go by WAY TOO FAST? It only gets worse, too. Happy birthday to your boy! What?! He is a year? Where does the time go? LOVE his gorgeous blue eyes. I love the sleepy newborn face. His smile is contagious. It will be no time before he is on his mission. One of our favorite blog babies. He's adorable. Happy Birthday Isaac! What a doll! I love how he gets chubbier and chubbier with each picture!! I love the first picture. He's a bundle of newborn yummy. Happy Birthday! What a cutie. Happy birthday to your little guy! I can't believe he's walking! Happy, Happy Birthday, Isaac!! He is such an adorable baby! Hey, I have some black eye pictures of my baby boys, too! All of the pictures are so great! Hey, thanks for smiling for me! I loved your comment on my blog! I wish I could learn as much as this in one year! Happy Birthday baby Isaac! We love you and miss you lots. Happy Birthday! I love the picture with the box-hat. So big and so cute! Those pictures are fub...especially because it helps me look forward to Faith's growing! have fun with Adrianne! Sweet tribute to your little guy. I also enjoyed your previous post on President Obama's inauguration. I loved the historicity of the day and feel that our nation's new leader sincerely wants to do a lot of good. However it's been a bitter wake-up call to remember that his definition of "good" includes supporting abortion & promoting other things that fly in the face of truths I hold dear. I do appreciate his emphasis on the positive and, in general, wish him well. Oh my gosh, it has been a year?! Happy Birthday Issac! Oh, I just want to give him a big squish!! He looks so loveable! What a doll! Happy birthday. Have fun celebrating. Has it really been a year? That kills me. I remember commenting in total excitedness when youhad him. A year??? Such a cutie! I hope you are enjoying your experience abroad, what a great opportunity. Thanks for accepting my box to Adrianne....I hope that guys have a fun time! Happy Birthday Isaac! I miss my cuddly pal. What a sweet little dedication to Isaac. He is loved! So cute! Everyone who posts pictures of babies makes me want to be a Grandma even more! Happy, Happy Birthday (late) Issac! !